Vitamin B1, B3, and B12 deficiency states. 1 ampoule l.M daily or as directed by the physician. The ampoules should be given only by intramuscular injection. For reconstitution, inject the solvent into lyophilized product ampoule and dissolve the mass thoroughly. Inject intramuscularly immediately after reconstitution. Don’t use the ampoules if the colour of the prepared solution has changed from red. Hypersensitivity to the product, thiamine, or to cyanocobalamin. Adenosine triphosphate (ATP) is a nucleotide having a fundamental role in biological energy transformation, being concerned with storage and release of energy. It is converted to adenosine diphosphate, release of energy occurring during the process. ATP acts by vasodilatation, improving the blood supply to cardiac muscle, and release of energy to the myocardium. Cocarboxylase, thiamine diphosphate ester chloride, is an essential coenzyme for carbohydrate metabolism; it catalyzes biochemical decarboxylation of many acids. Vitamin B12 (cyanocobalamin) acts as a coenzyme that stimulates metabolic functions; it is needed for cell replication, hematopoiesis, and nucleoprotein and myelin synthesis. It is used in the treatment and prevention of vitamin B12 deficiency; which leads to the development of megaloblastic anaemias, demyelination, and other neurological damage. Nicotinamide (vitamin PP or vitamin B3) stimulates lipid metabolism, tissue respiration, and glycogenolysis. It restores normal level of vitamin B3; and is used in the treatment and prevention of nicotinic acid deficiency which leads to the development of pellagra, mental and neurological disturbances, and other symptoms. Nicotinamide has been shown to inhibit the destruction of pancreatic beta cells in vitro and is therefore investigated in the prevention and treatment of type I diabetes mellitus. Store at a temperature not exceeding 30°C. 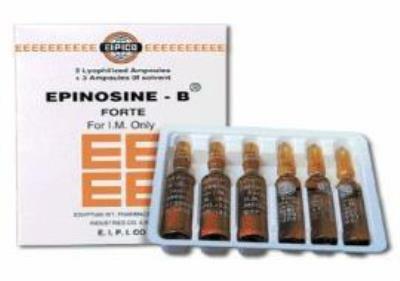 EPINOSINE-B Forte Ampoules: Box containing 3 ampoules of lyophilized powder + 3 solvent ampoules of lidocaine hydrochloride 10 mg/2 ml.